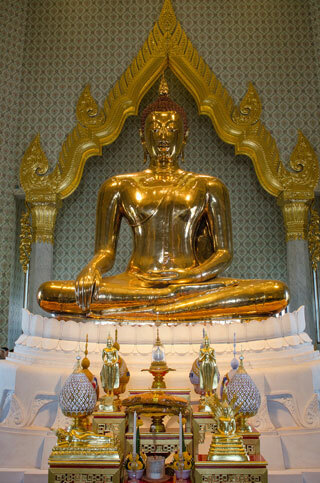 The Golden Buddha is a gold statue, with a weight of 5.5 tons (5,500 kilograms). It is located in the temple of Wat Traimit. At some point, the statue was completely plastered over to prevent it from being stolen. The true identity of this statue had been forgotten for almost 200 years. During the final attempt to lift the statue from its pedestal in 1955, the ropes broke, and the statue fell hard on the ground. At that moment, some of the plaster coating chipped off, allowing the gold surface underneath to be seen. This article uses material from the Wikipedia article "Golden Buddha Statue", which is released under the Creative Commons Attribution-Share-Alike 3.0 License.